Another day, another sequencing company. This time Apton Biosystems. Checkout the complete list of sequencing companies, for links to all other posts. Unfortunately there’s not much to say about Apton, but this post contains what information seems to be available. According to their site Apton Biosystems was founded in 2012. SEC filings  indicate they raised ~10.5MUSD in 2015. The website lists investors as including Khosla Ventures, Cenova Capital, Samsung Catalyst Fund, and Cowin Venture . From archived copies of their website at the Internet Archive, the site was updated sometime in 2018 (before April?) to provide more information and explicitly mention sequencing (as seemly the focus). Existing patents however only mention sequencing incidentally (by my reading) and focus on protein detection. There’s very little information on the Apton sequencing approach, which I would assume is still in development. Current patents do not refer to a specific sequencing approach (for example, sequencing by synthesis or sequencing by hybridisation), and only mention sequencing as one possible application. The website is more explicit, saying “Apton Biosystems is developing a high throughput system that can sequence the human genome for $10.” . A number of DNA sequencing focused jobs have also been posted  . A recent poster provides a little more information . 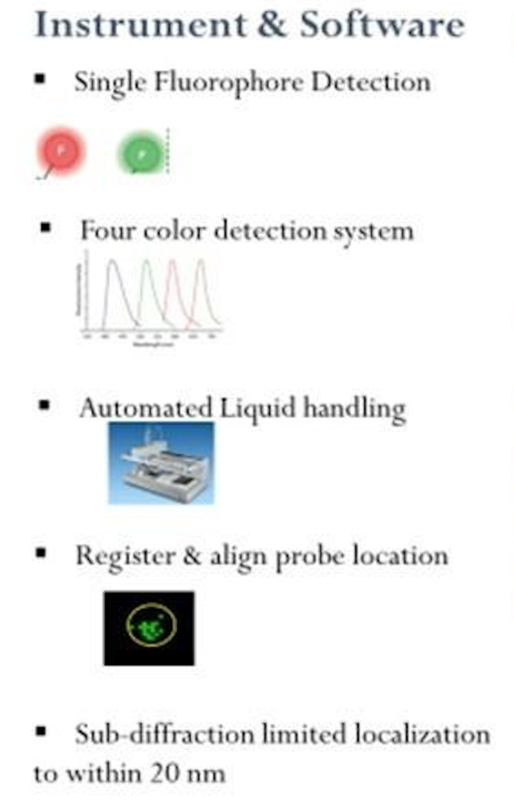 In particular it’s clear that they are developing a single molecule optical approach (like Helicos, Direct Genomes, SeqLL), but 4 color (one would assume one dye per base, but see below). 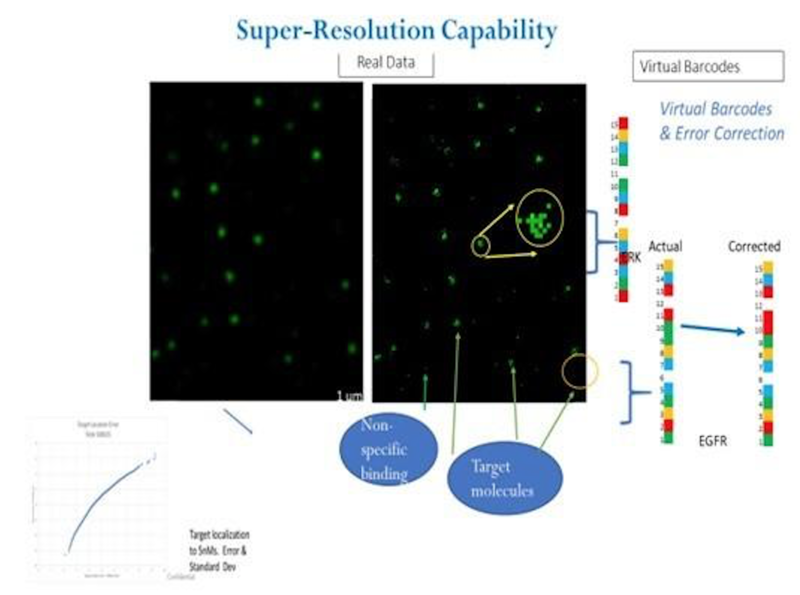 They say the approach can give 20nm resolution, and is therefore a super-resolution approach (beating the diffraction limit). However, there’s still no mention of a particular sequencing chemistry, just that that SNPs were detected using hybridisation probes and single base extension reactions. In Illumina sequencing cluster positions have long been identified with sub-pixel resolution (you do a gaussian fit around the maximum intensity to get a sub-pixel resolution cluster location) as such it could be said that the Illumina approach can/does have super-resolution qualities. However, without more details of the sequencing approach used by Apton it’s unclear what advantages this brings. 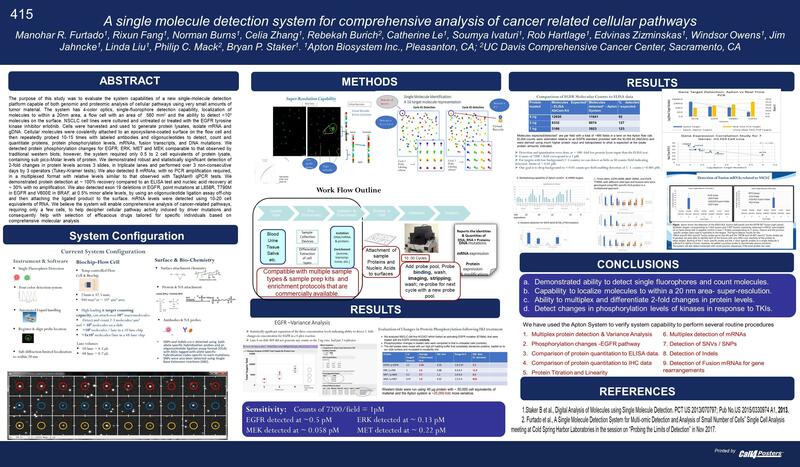 The poster and patents, also mention error correction, but it’s unclear how they would apply this to sequencing. The use of error correction in the platform, obviously bring to mind Cygnus’ approach. I’ll be on the look out for more patents, and more information as it appears. Long section describing the use of aptamer probes with a long tail. The aptamers are detected by synthesising a complementary strand, and detecting the associated incorporations using an ISFET sensor (this seems odd in an otherwise optical system).